J. Grady Brannen 82, went to be with his Lord and Savior Tuesday, July 17, 2018 at Ogeechee Area Hospice Inpatient Center in Statesboro. 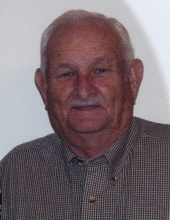 He was born September 3, 1935 in Glennville, GA to Fentress and Inell Poppell Brannen and lived here all of his life. He was self employed, working with Gulf Oil and Amoco Oil Companies where he serviced service stations and tobacco barn cookers all over South Georgia for over 30 years. He was a farmer who loved to plant, see things grow and enjoyed sharing his garden and fruit with his friends and family. He was a loving, caring husband, father, grandfather and great grandfather. He was a faithful member of Northside Baptist Church. He is preceded in death by his parents, son, Michael Brannen, Brother, Theron Brannen. Grandchildren, Jeremy Brannen (Kyleen), Joe Banks (Valorie), Trisha Schwonke (JR), Jason Brannen (Elaina), Casey Brannen, Amanda Blocker, Nicholas Blocker, seven great grandchildren, several cousins, nieces and nephews also survive. Family will receive friends beginning at 5:00 pm, Thursday, July 19, 2018 at Brannen Kennedy Funeral Home. Funeral Services will be held 11:00 am, Friday, July 20, 2018 at the Chapel of Brannen Kennedy Funeral Home. Burial will be in Watermelon Creek Church Cemetery.